This is an update / continuation of my initial impressions post about purchasing a Nissan LEAF. One megawatt-hour update! It's taken over six months, but I have just put my 1000th kWh of energy into the LEAF's Level 1 EVSE. I briefly played with having the car pre-warm or pre-cool itself for my morning commute, but found that unnecessary, so nearly all that energy (minus DC conversion and charging losses) has gone into the battery. I've charged the car 73 times, in 202 days, almost three times a week on average. In that time, I drove 3521 miles, or just under 50 miles per charge, on average. I've charged the battery by 56% of full-charge capacity on an average charge, which reflects my charging plan: plug the car in when it's below 50% state of charge. By keeping track of how much energy is used for each charge, and what percentage of the battery that represents, I'm able to estimate the battery size. For example, if I charge the car when the battery management system says I'm at a 42% state of charge, and it takes 14kWh to fully charge the battery, I can estimate the battery size as 14kWh/58% = 24.14kWh. Over the first 1MWh, that estimated battery size is 25.7kWh. The astute reader will have noticed either that this is larger than Nissan's advertised capacity, or that this estimate assumes the charger is 100% efficient, which it is not. If we take our 25.7kWh number to be the input energy for a full charge, and we assume the battery capacity (recoverable energy stored in the cells) is exactly the advertised 24kWh, this lets us calculate the EVSE+charger efficiency, which comes out to 93.4% which seems entirely plausible. Estimates online of charging efficiency for various Li ion battery chemistries range from 80 to the mid-to-upper 90 percent range. Almost 94% seems quite good, assuming 24kWh is actually stored in the battery. If the real capacity is only 23kWh then our measured charging efficiency drops to just below 90%, a much less impressive result, but probably more realistic. Many of the habits I learned to increase fuel economy in my previous gasoline-powered car carried over to driving the LEAF. However, regenerative braking was completely new to me other than a few brief trips in a Prius, and took a bit of getting used to. These days I have a much better idea of when I can engage the regen to bring me to a good speed for making a turn, and I habitually check my rear-view mirror to see if doing so is likely to annoy a driver behind me. 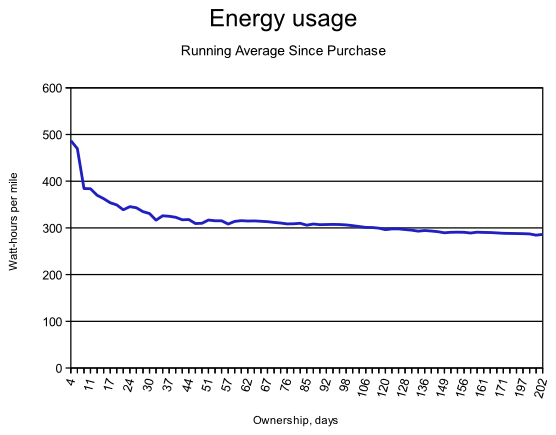 That learning process is visible in the graph to the left, which tracks the ownership-to-date average energy use per mile driven. From my first 50 miles at nearly 500Wh/mi (all city driving! ), the average has dropped to about 280Wh/mi and the average over my last 500 miles or so is about 260Wh/mi. That's nearly twice as efficient, despite the long average containing perhaps 25% highway miles versus that first charge's 30-45mph city driving pattern. The other effect that is probably visible in the graph is the decreasing average air density as summer has approached. The endpoint of that graph, in August, is at nearly the peak average temperature in Wisconsin, meaning it corresponds to the minimum average air density and thus aerodynamic drag. Some portion of that gain is lost again in air conditioning power, and the arrival of winter again will provide some additional interesting information as I switch from AC power losses to heating power losses, while also coping with denser air. Another issue will be battery heating. Single-charge range will drop due to denser air, poorer road conditions, and less-efficient winter tires; I'll also lose range due to the power used to maintain minimum battery temperatures over the 2-3 days between my typical charges. I'm not sure how big a gap that will open up between my real-world miles-per-kWh and the theoretical range if I simply got into a fully-charged car ard drove. Check back for a winter update in another six months! Just as with the numbers I've quoted in the battery size estimate, these numbers record the energy input to the battery per mile driven. The LEAF's computer will report an average miles per kWh which, at about 4.1, implies an energy cost of about 240Wh/mi. I don't know how long the averaging period for that display is, so it's not directly comparable to any of the numbers I have measured. If it were a lifetime-to-date average, or an average since the trip odometer were reset, then it would be comparable to my charging data, and would provide a way to estimate battery capacity and charging efficiency. UPDATE: The first 1000 days.